Children between twelve and eighteen months are quickly becoming more mobile as they learn to stand and walk, which also frees up their hands exploring and carrying objects. Along with huge strides in mobility, children are making equally large strides in language comprehension, problem solving, and concentration. Slightly more complex toys and puzzles, and creative activities like drawing are great choices for this age group. Avoid electronic toys that do more to entertain and distract a child than to encourage play. And avoid containers that restrict movement like walkers or activity chairs. These wooden bowls from Grimm's Toys are perfect for stacking and nesting activities. Start with two or three, then add more as the child progresses. Pounding and smashing is a natural experiment for this age group, and this toy offers a way to engage in this activity without damaging anything. This toy allows your child to see her progress as she pounds the pegs through the base, and when she's done, she can flip it and start over. These large crayons are perfect for one to two year old hands who are just learning to hold objects and intentionally make lines on paper. They're nontoxic and too large to choke on or break easily, so they're a great choice for children who are inclined to put things in their mouths. This simple, sturdy shape sorter is a fantastic puzzle for 1-2 years. The lid of this wood box is easy for 12 month old hands to lift up and replace. This toy also doubles as an object permanence toy, since the shapes seem to disappear into the box when sorted correctly. Large exercize balls are an endless source of fun for young toddlers. It's easy for children to "catch" when rolled to them, it's light enough to be picked up and thrown, and they can push, jump, and bounce into it. 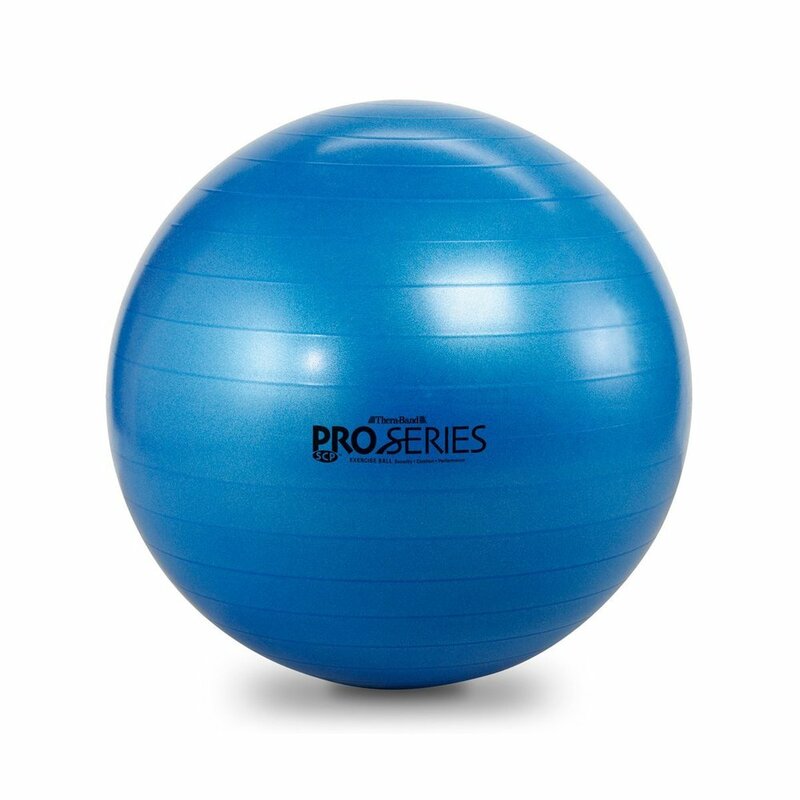 This exercise ball features thick rubber walls that slow-deflate when punctured and it's easy to clean. This simple chunky puzzle offers an introduction to sorting by shape and matching. Knobbed pieces are a bit too difficult for most children this age, so look for a first puzzle with large, thick pieces of wood and less than 5 pieces. 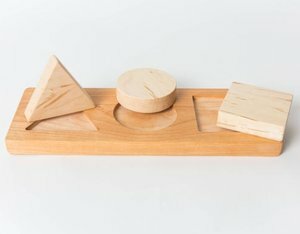 Introduce this puzzle with just ONE shape and the board, adding the other two later. 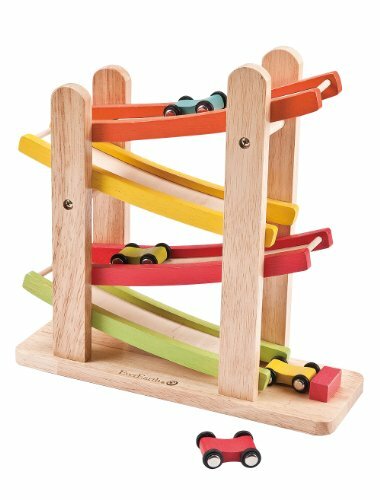 Every Montessori mom blog lists this car ramp racer from EverEarth, and for good reason. It's a simplistic, compact design that's mesmerizing for young toddlers. The stop block at the end is a nice touch, so cars don't race across the room. This toy encourages repetition with very little reset time, and is totally child-powered. Beanbags are an incredibly versatile play item for young toddlers. Make a throwing game, stack them high, then knock them down, or balance one on your head. These triangular beanbag blocks are perfect for smaller hands to grab, stack, or throw, and they come with a handy fabric bag for storage. Note that these are filled with small plastic beads, and should not be used with children younger than 12 months for safety reasons. Learning to drink from a real glass is a welcome challenge to the 12-18 month old. Introduce the idea with tiny glasses like these from For Small Hands. These are made of thick glass and hold just a few mouthfuls of liquid to make misses easier to clean-up. I've also used these shot glasses from IKEA as a first glass in my toddler classes with success. For family meals, a highchair like this one is most convenient. I recommend this design from Tripp Trapp for its durability, independence, and long-term use. The seat and foot shelves are fully adjustable, and allows your child to climb up herself. Plus, the 5-point harness straps close in the front, so your child can learn to buckle herself in by herself. Many children this age eat like tiny birds, just a handful of food at a time. Divided bowls with lids are useful to pre-portion finger foods, yogurt, or snacks into divided plates like these and then snap the lid on whatever wasn't finished at meal time. A ride-on toy like this Wheely Bug is perfect for twelve to eighteen month olds who are just learning the idea of pushing with their legs. It's almost impossible for a child to tip this over, and the wheels allow it to move in all directions quite easily. Playing with water is a favourite activity for most young children, and a watering can like this encourages purposeful help. Introduce a watering can outside so your child can practice dumping as much water as she likes without drowning your potted plants. This shovel is great for toddlers. Its thick plastic handle and scoop withstand repeated use, and the curved design helps dig deeper and more gracefully without added force. When a child is learning to walk, good shoes are of utmost importants. Boots, flip-flops, and child size high-heels (!) make walking more difficult and should be avoided. Feet and legs need to move in a natural fashion, and that requires a sneaker, sandal with an ankle strap, or bare feet. Look for Velcro or elastic closures that encourage a child to put shoes on herself, and a sturdy but flexible sole. A set of picture cards is great for practicing familiar words, and keeping them on a ring like this allows for easy travel. The simple pictures are clear, the words and objects are familar to many toddlers, and the tapered top makes flipping easy.